Look who is a big boy now. 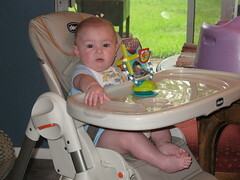 Carter loves his high chair. Thanks to our small group at church for this great gift. 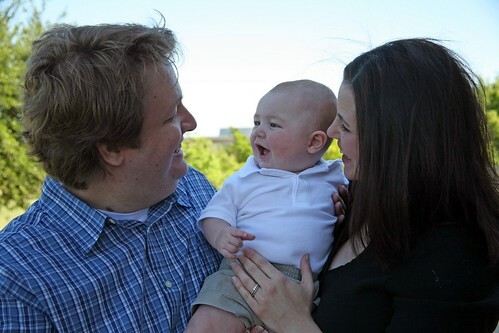 We recently had some pictures taken. Click here to see the whole set. Carter was a good boy and seemed happy to smile for the camera. Hannah Vickers took our pictures around ACU . As I reflect on the past two years and all that Will and I have experienced trying to conceive our sweet little boy, I am reminded of one of favorite scriptures in which I read daily to get me through the end of the day. 2 Corinthians 1:3 reads as follows, "Praise be to the God and Father of our Lord Jesus Christ, the Father of compassion and the God of all comfort, who comforts us in all our troubles, so that we can comfort those in any trouble with the comfort we ourselves have received from God." This is significant here and now because this past Sunday, Will and I connected with a young woman who happens to be experiencing the same process that we went through and with our doctor in Lubbock. Her journey, in my opinon, has been a little rougher than mine. I realized that our meeting was not by chance. I believe that our experience for the past two years was revealed as a blessing to us through the oppurtunity to share it all with this nice young woman. God has a wonderful plan in our lives and He uses us for His glory if we just allow Him to. Twice in two days I find myself babyless. For the first time yesterday, Carter went to the nursery at church. He likes church. He likes looking at all the people. I think he likes the singing. He usually falls asleep in the sermons. Yesterday, Cilla took him out to try to get him to go to sleep (his regularly scheduled nap time is right in the middle of church). She came back empty handed. So we had half a church service and bible class without Carter. I think we all handled it pretty well 🙂 The nursery worker said he did well away from his parents. Today, Cilla and Carter have gone to Brownwood to visit Grandma and Poppa (Cilla's parents). It is nice that Cilla's parents live close enough to make a day trip. We're envious of Katy's family proximity to my parents and the time they have spent with Grammy and Boppa (my parents). You have been in our lives for 5 months now. It seems like just yesterday we were holding you in the hospital in amazing disbelief that you were finally here. Now I can't even imagine how one day in my life without you would be. These past months have gone by too fast. You are such a big boy and are very smart. You take after your daddy just as I wished. You have found your hand and are becoming more aware of yourself. You reach out to touch your reflection in the mirror. Your latest endeavor is rolling over. You have mastered this little trick and get easily frustrated when you end up on your tummy and can't do much of anything else. You are now enjoying some rice cereal once a day. As you reach for the spoon and open your mouth at the same time, I realize just how fast you are growing up. 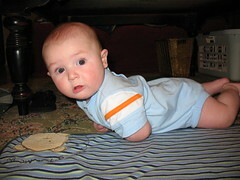 You are very ticklish and love for mommy and daddy to "snack" on your tummy anytime of the day. This quickly turns a meltdown into a gigglefest. You are quite predictable and mommy knows just how to read your every move. Daddy asked me what my favorite part of my day was and I replied, "the part when I make Carter smile!" I think you are the greatest little boy. I truly never knew I could love someone as much as I love you. Daddy and I want you to know this and feel loved every minute of every day. I also pray for you daily. If you grow up to be as compassionate and kind as your daddy, my job as your mother will be fulfilled. May you grow in the Lord and know Him and His blessings.